Like most bands who benefit from the luxury of living in a creative borough where artist and community-driven venues like the Silent Barn are a necessary—and dwindling—resource, Alyse Lamb (EULA, Parlor Walls, Famous Swords) quickly organized a show to help raise money for the Barn’s relief efforts. She then asked us if we would be willing to co-present it, to which we couldn’t say “yes!” fast enough. Joining us this Thursday, October 8 at Palisades will be Celestial Shore, Mega Bog, Parlor Walls, Real Adult, SIRENS, and a DJ set by Future Punx. 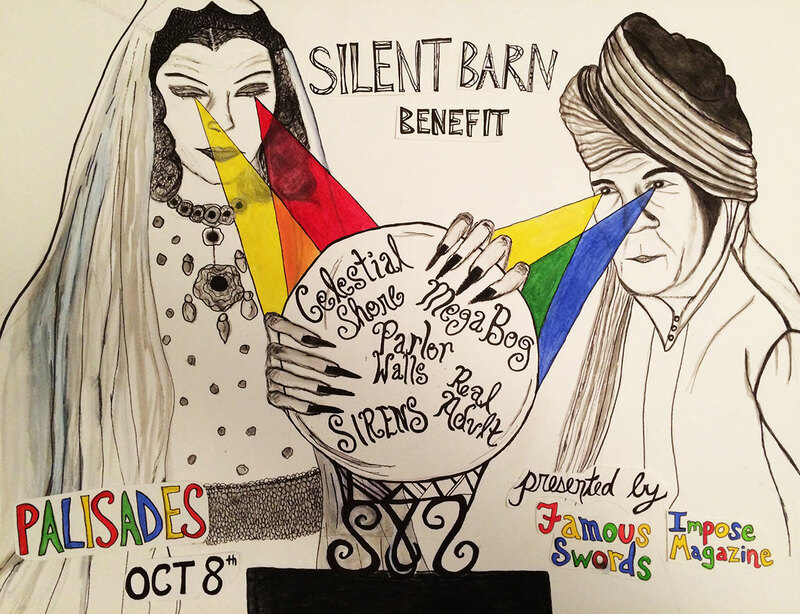 The bands will be donating their time with all proceeds to benefit the Silent Barn, so the least you could do is offer up a mere $10 to enjoy an evening of great music, friends, and the knowledge you’re helping rebuild a great place. Tickets are available in advance, and if you can’t make it to the show, we strongly encourage you to donate what you can.